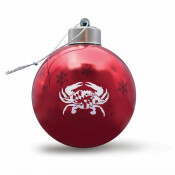 Whether near or far, you'll always be home for Christmas with our “OLD BAY Can” ornament. Spice up your holiday season the true Maryland way by trimming your tree with this unique light-up glass bulb. The snowflakes of the ornament are transparent so when the LED light is on, it casts a snowflake pattern. An on/off switch on top of the ornament toggles the light up feature. The LED bulb runs off of three Replaceable Button Cell Batteries (Batteries are included). The top assembly comes off for easy replacement of the batteries. Each ornament comes packaged in a clear acetate box with instructions for the ornament. The snowflakes of the ornament are transparent so when the LED light is on, it casts a snowflake pattern. An on/off switch on top of the ornament toggles the light up feature. The LED bulb runs off of three Replaceable Button Cell Batteries. The top assembly comes off for easy replacement of the batteries. Each ornament comes packaged in a clear acetate box with instructions for the ornament.